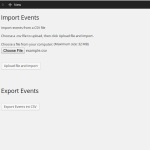 This plug-in allows to import events from a CSV file into Event Organiser. 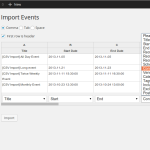 You can also export events from Event Organiser into a CSV file. Please note that this plug-in still in beta. I welcome feedback, issues and pull-requests. All being well you should now see a preview of the CSV file, along with a drop-down option at the base of each column. If the preview looks wrong, try selecting a different delimiter type (comma, tab, space) at the top. If the first row of the CSV file is a header, select the option indicating this. The first row will then be ignored. Recurrence Schedule (if the event recurs, how it repeats: (once|daily|weekly|monthly|yearly|custom). 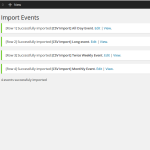 Add support ‘maps’ for importing from other applications (where format of exported CSV file is prescribed).